Did you have a life-changing professor? Mine got fired on Aug. 3. 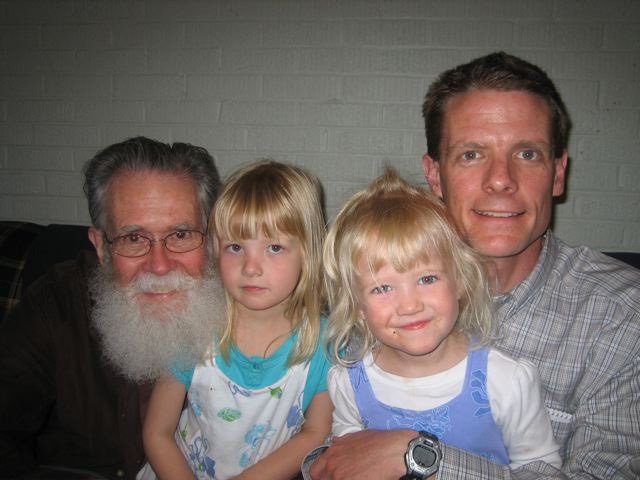 John Rubadeau, left, with my daughters and me in 2008, 20 years after I had been fortunate enough to have taken his analytical writing class as a University of Michigan sophomore. I posted this on the Wolverine Forum, the University of Michigan Alumni Association’s online community a few days ago; figured it should see the light outside the community’s gates and re-post here. For those of you who missed the recent articles in the Michigan Daily or the Ann Arbor News, John Rubadeau, one of the most popular teachers the University of Michigan has ever had, was fired Aug. 3 – on what appear to be dubious grounds, if the interest in his situation by the union representing U-M lecturers is any indication. Especially when it’s convenient to not discuss personnel matters. Rubadeau can’t comment because he probably has a solid legal case, and his lawyers (former students are coming out of the woodwork in support, and as the Michigan Daily piece notes some of them are… lawyers!) are suggesting he clam up. A brief note to express my support for John Rubadeau continuing to teach at the University of Michigan, where I had him as a sophomore in 1988. I’m a professional writer now; his lessons have stayed with me. I’ve stayed in touch with John for 30 years. He is, as you know, far from PC. I am unfamiliar with the case being made against him. But I would guess the alleged transgressions can be ascribed to a willful lack of filter, as opposed to intended harassment or anything which, taken individually and in context, could reasonably be constituted as such. Most worrisome to me would be if an amalgamation of anecdotes by UM employees were to build into anything short of an ironclad case leading to the dismissal of a hugely popular and highly effective instructor of English. That is, if your customers – the students – were to lose the opportunity to learn from Rubadeau because he rubs colleagues the wrong way. I’m not familiar with the details, but I would assume, given his prominence and popularity, they will come to light. Will they wilt in the sunshine? Rubadeau swears like a sailor and has little tolerance for PC constructs that screw up the English language. But he is a master of this language in which I attempt to type, an incredible craftsman and editor, wildly enthusiastic, just a phenomenal teacher and, really, life coach – to generations of students now. I wouldn’t be a writer today if it weren’t for John. He recognized a kindred, godforsaken soul who was, like it or not, born to be a writer. I was slow to come to the recognition (graduated with a BBA; went into consulting; finally got around to this low-paying, fascinating, fulfilling line of work when I was 30), but John was right all along. He won the 2005 Golden Apple Award (UM’s top teacher; student-nominated). Second-most popular prof on RateMyProfessors.com. And so on. I would be thrilled to have my daughters in his classroom (They’re a few years shy of college. Plus he’s been canned. For “personnel matters.”). Rubadeau is irreplaceable. Such a talent should have been embraced until he decided to retire. Yeah, he’s 78 – but 78 going on about 38. And never mind that his wife has a terminal lung disease. So let’s take stock of what the U-M administration have accomplished here. You’ve angered alumni. You’ve deprived students. You’ve opened the door to lousy PR and, potentially, financial risk in the form of a wrongful-termination lawsuit. For what? Because a handful of thin-skinned English department employees took offense at some aspect of their interactions with the man? How many Golden Apples among them? This is disgraceful university politics, and the losers are future U-M students. His words still resonate with me today.